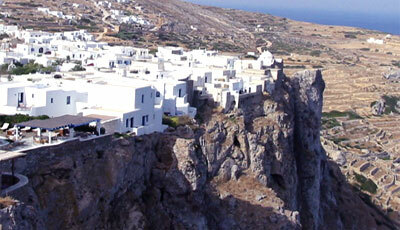 Folegandros is a medium size island and part of the Cyclades. It has an area of 35 km² with approximately 700 people living there. The island for a long time was well known as an untouched little paradise. It was only a question of time when this unspoiled little gem would become too famous for maintaining its reputation. In recent years it became more and more popular with a rather wealthy clientele that too wanted to enjoy the tranquility and beauty of this place. That doesn't mean one should not go there anymore. Folegandros still is a good place to be. It is rather difficult to get to Folegandros. There is no airport and ferries are not as frequent as they are in other places. The little port closes when the weather gets too rough meaning you could be stuck there for a while. There is a post office on the island but no bank. Do not rely on the ATM. It is possible to exchange money but you may not be able to withdraw. Bring enough cash! Everything you need you will find in one of the supermarkets, at this stage you can even rent a bicycle, scooter or car. There are a few small settlements on the island. The local "capital" is Chora. Up north you will find Ano Meria, the port town is called Karavostasi. Town is a bit of an exaggeration though. There are only a few houses and that’s it. With its 300 people or so living here it is the biggest settlement on Folegandros. Chora is 3-4 kilometers away from the port in Karavostasi. The small town is a typical Cycladic village; white houses with blue window-frames in a romantic setting. You'll find the typical narrow alleys, tiny little squares, churches and even a castle. Chora is situated at a cliff 300 meters above sea level. The views are spectacular. If you walk up to the little church Panagia on the hill above the village you get an even better view. Accommodation during summer can be quiet expensive. At this stage they even have a luxurious hotel that charges 150 Euros a night. It really is a shame. The upside is that there now is some sort of night life with a couple of bars. Still reasonably cheap is food. You'll easily find some small restaurants that serve typical Cycladic dishes. Recommended are O Kritikos – a small taverna with a good BBQ selection – and the restaurant Chic. The small village is point on entry for everyone since this is where the port is located. Some 50 people live here, there are a couple of restaurants and places to stay. The local beach is not particularly impressive but if you walk for about onbe kilometre you get to Livadi beach which is pretty good. Next to it is the only camp site on the island (Livadi Camping). The latter I would describe as Spartan; one could also call it very basic. This applies to everything on this camp site including the sanitary arrangements. Rooms in Karavostasi are significantly cheaper than in Chora. This has to do with the total lack of anything that one would even remotely associate with the word entertainment. The small village with its 200 people living there is situated in the northern part of Folegandros. There is a small museum and nearby – probably a lot more interesting – the islands best beach. It admittedly is a bit of a walk but its well worth it. As mentioned before Folegandros is rather difficult to reach. There is no airport so the ferry is the only way. There are 4-5 a week from Athens and the bigger Cycladic islands. To get to nearby Syros, Milos, Sifnos, Serifos is even more difficult. Ferry tickets are available in the small travel agency in Chora or directly at the port. The main road from the port to Chora continues to Ano Meria. It's a paved road and surprisingly good. There are regular busses between Chora and Karavostasi (pretty much every hour) and between Chora and Ano Meria although not quite as often. The camp site has a free shuttle to and from the port. During high season there sometimes are additional busses to the various beaches. Some of the local fishermen offer boat trips from Folegandros to the various beaches. They drop you there in the morning and pick you up in the late afternoon. Most of these beaches you can easily reach by foot. Interesting: The largest stadium of the world is in North Korea.